When it comes to men’s fine fashion, the right clothes can seem like everything. While a well-tailored suit, a colorful pocket square colorful pair of socks, a crisp starched shirt, or new leather boots leather shoes are certainly good sartorial choices, it can all go to waste without good posture. One of the most powerful benefits of a well-dressed man is the non-verbal communication it gives off. The clothes, shoes, jewelry, and accessories on your body speak volumes to others about your culture, mood, personality, and your confidence, which can completely change social or professional situations. However, even the most casual of dress can look vastly better on a man with good posture then a suit on a man with poor posture. The vast majority of human communication is subconscious and if you want to look your best, you have to physically give off a good impression beyond your clothes. Many people practice elements of closed posture. Closed posture includes crossed arms, crossed legs, slumped shoulders, holding your neck forward/down, and showing the back of your hands. Closed posture gives off a vibe of disinterest and detachment, and can even seem hostile to some depending on the circumstances. Rather, you should be striving to communicate a friendly attitude through open posture. When sitting, spread your feet wide and take up as much space as possible. When sitting, stay casual by keeping a relaxed and confident composure. When speaking to people, hold your head level and make consistent eye contact. Showing the palms of your hands when speaking can make you seem more trustworthy. Instead of slouching while walking, lift your chest and throw your shoulders back, aim to stand up tall, and walk slowly and confidently. Good posture is not necessarily standing or sitting ramrod straight. A good test to see what correct posture feels like is known as a ‘wall test.’ Stand with your head, shoulders and back against the wall and keep your heels a few inches forward. Try to keep this alignment when you step away from the wall. The goal should be to look relaxed and make sure the natural curves of your spine are maintained. Good posture can make the clothes you wear look even better because you give off an added degree of confidence and poise. Aside from aesthetics, good posture can also reduce body pain, help with concentration, and even help internal organs work better. Changing the type of bag you carry can also have a big effect on your posture and overall look. Researchers from the University of Illinois at Chicago published an article in 2008 that suggested people should only have about 10% of their body weight in a bag they are carrying. They found that loads that were too heavy or carried in the wrong places can not only destroy good posture, but lead to muscle strains and chronic pain. This makes a leather messenger bag ideal since it is worn across the body, thereby distributing the weight between one shoulder and the opposite hip. Practicing good posture can be hard, especially if you in the habit of slouching or standing with crossed arms. 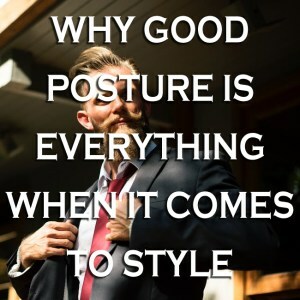 However, good, confident posture could be the biggest wardrobe upgrade you ever give yourself, and really set yourself apart from the vast majority of people.